What does your future hold? Find out and entertain family and friends with this incredible deck of 78 authentic Penny Dreadful Tarot Cards from Bif Bang Pow!. 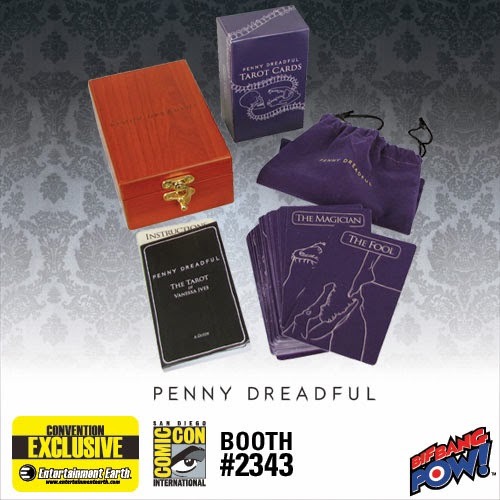 Just like the cards used by the show's heroine, Vanessa Ives, they feature marvelous series-true artwork and an informative instruction book that will get you into the Tarot Reading action in no time. Plus, this Convention Exclusive comes in a gorgeous engraved wooden box! Made of smooth laminated paper, each Tarot card measures about 4 3/4-inches tall x 2 3/4-inches wide, and the deck comes in a themed velveteen drawstring bag that fits very nicely into the 5 7/8-inch tall x 4-inch wide x 3 1/8-inch deep wooden box that features a hinged lid with the Penny Dreadful logo engraved in the top. The instruction book measures about 4 3/4-inches tall x 2 3/4-inches wide and contains card meanings, popular card layouts, and guidelines. It will introduce you to the Tarot and walk you through the information you need to conduct your own Readings!